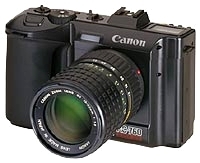 CANON RC-760 - 1987. Still video camera. 600,000 pixel CCD. USA Today began covering special events with the Canon RC-760 camera in 1987. USA Today published the first color still-video photos to appear on the front page of a U.S. newspaper. Shot with a Canon RC-701 by staff photographer Tom Dillon, the images were taken at a World Series game in Minneapolis. Photo editor Frank Folwell was impressed with the transmission speed - he was viewing the images on his computer in Virginia 12 minutes after they were taken. But the technology still had a long way to go to meet image-quality standards even for newspapers. The Associated Press announced plans to convert from analog to digital image transmission, cutting transmission times by 90 percent. The conversion took about five years to complete, but it helped to push newspaper photography into the digital age. 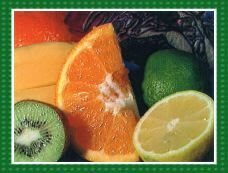 The fruit photo on the right is an example of a RC-760 image. The RC-760 is virtually the same as the earlier RC-701, except that it has 600,000 pixels rather than the 380,000 pixels of the RC-701. Original MSRP $5,500 ($11,300 in 2013 dollars). There were very few RC-701s and RC-760s produced, thus they are in high demand by collectors today. Most are in museums or held by collectors who are unwilling to part with them because of their rarity. When they do appear on eBay the price for the body and a single lens may be up to several thousand dollars, sometime more (2013). CASIO VS-101 - 1987. 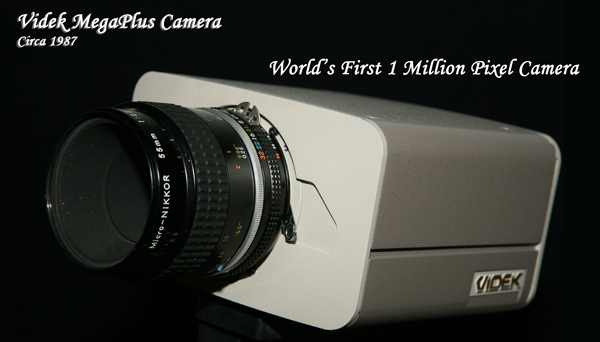 First marketed MOS imager (metal oxide semiconductor) still video camera. 280K pixel CCD. 50 erasable frames per two-inch floppy disk (exposed at up to 5 frames per second). Approx. $1500. We were extremely fortunate to purchase this very rare new-in-the box VS-101 a number of years ago for only $100 complete with all accessories. We believe we were the first digital camera history web site to provide a photo and information concerning this camera. ELECTRONIC IMAGING PHOTO BOOTHS - 1987 . ImageWare Systems, Inc. maufactured and operated photo booths from 1987-1994 which allowed customers to have their photos placed onto postcards. The company sold one of its patents to Atlus, a Japanese company that was involved with the production of Print Club photo booths (see 1995). FISHER-PRICE PXL-2000. - 1987. 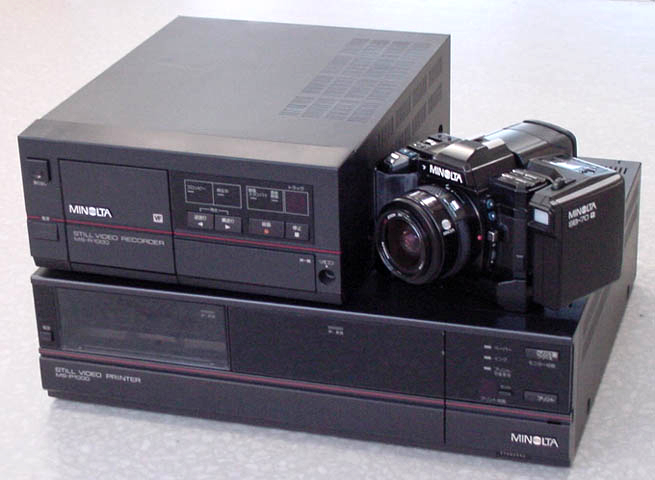 The PXL-2000 was an unusal video recorder in that it recorded on an audio cassette rather than on a video cassette. Only about 400,000 units were sold and most of them were discarded after becoming disfunctional, so there are relatively few now available. This combined with the fact that it has become someting of a cult icon has caused its current market price (2017) to remain much higher than many other much more sophisticated vintage video recorders. Its original MSRP was about $179, but may now cost you up to $400 on eBay. 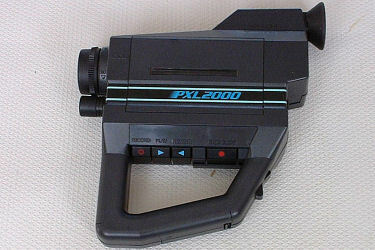 The PXL-2000 was created by a team of inventors led by James Wickstead, who sold the rights to Fisher Price in 1987 at the American International Toy Fair in Manhattan. 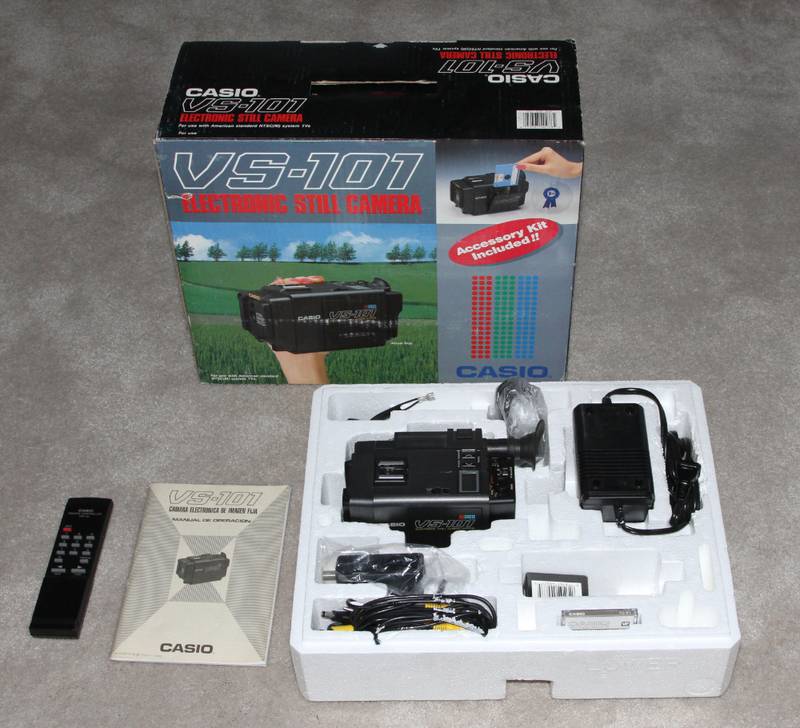 There are many web sites devoted to the continuing use of these cameras by artists and other sites that include conversion instructions for adding direct video and audio output connectors for use with standard VTRs. Some sites even offer repair / conversion services for pay. FUJIX ES-2P - 1987. Follow-up of the 1985 still video ES-1. Popular Photography, November 1986, page 70. We believe we were the first digital camera history web site to provide a photo and information concerning this camera. KODAK STILL VIDEO SYSTEM - 1987. 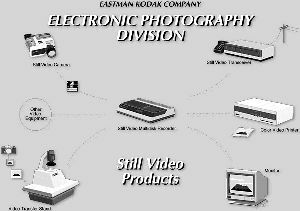 Kodak entered the still video market with products for recording, storing, manipulating, transmitting and printing electronic still video images. Understanding Electronic Photography, John J. Larish, 1990, p 31. Proposed Kodak electronic camera using digital audiotape image recording or portable CD image recording. 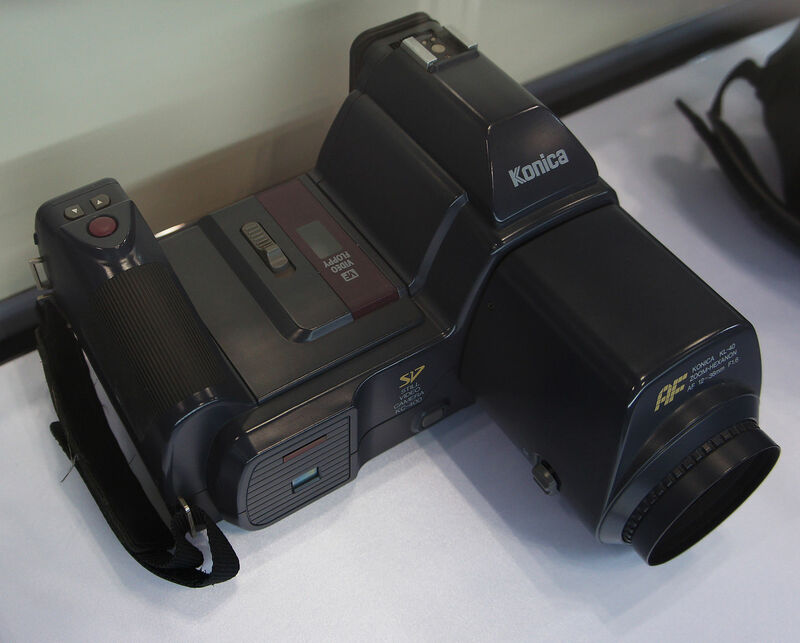 Camera designed in 1987 by Pete J. Sucy, a Kodak photo illustrator and filmmaker , but not approved (unfortunately) for production by Kodak management. The camera would have stored raw image data and the host computer software would do the conversion to the appropriate file format for the host computer. The intent was to have an ADC (analog to digital converter) within the camera and the camera would store only digital data. Design included interchangeable lenses and a portable CD burner - an idea that Sony utilized thirteen years later with the 2000 Mavica MVC-CD1000 which stored images on mini CDs. Steve Sasson, also a Kodak engineer, had previoulsy built the world's first known still image digital camera (see 1975), however, Kodak managment failed to follow up on these two internal opportunities to establish leadership in in the developing field of electronic photography. Click on image for enlarged view. Information and drawings provided by Pete Sucy. We believe we were the first digital camera history web site to provide a photo and information concerning this camera. KODAK PROTOTYPES - 1987. They recorded 25 full frame images or 50 field images on a still video floppy. The cameras along with other equipment were denoted as the SV-8200 and SV-8300 by Kodak. The cameras along with associated equipment could store analog still video images and print them in color. The entire system is shown above Pete Sucy's proposed camera. Image provided by Pete Sucy. Note: Pete has a very detailed year-by-year history of the early years of digital photographhy development on his site - well worth reading! KODAK / VIDEK MEGAPLUS - 1987. In 1986 Kodak announced the development of the world's first megapixel digital sensor small enough to function in a handheld camera, a sensor that had 1.4 million pixels. In 1987 Videk, a Kodak venture company, began selling the Megaplus machine vision camera incorporating Kodak's 1.4-megapixel sensor. 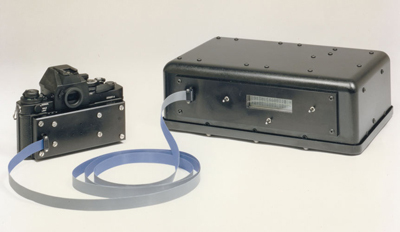 The MEGAPLUS was a high-resolution, charge coupled device (CCD) camera designed for scientific and industrial imaging applications. 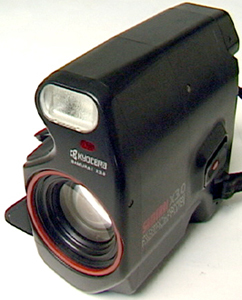 The camera featured a solid-state full-frame imager containing 1320 H x 1335 V light-sensitive pixels. MSRP varied from $10,000 to $40,000, depending on sensor quality. 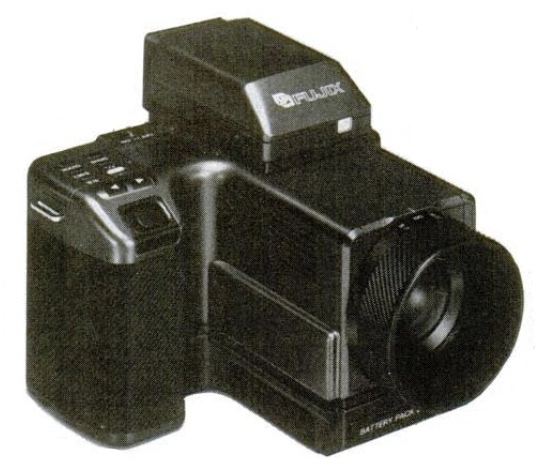 Some web sites state that the Megaplus was the world's first commercial digital camera, however, it required an external signal processing unit (28 pounds) and a computer to produce and store digital images. Videk is now a privately held company. Photo kindly provided by Jim Reda, Videk VP. We believe we were the first digital camera history web site to provide a photo and information concerning this camera. KONICA KC-400 1987. Still video camera. Recorded to floppy disk. 1/2-inch 300K CCD. MSRP $3,879 (approximately $7,200 in 2009 dollars). It used the Konica KR-400 to play images. Understanding Electronic Photography. 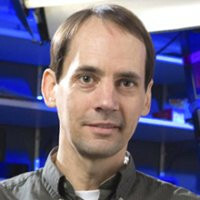 John J. Larish, 1990, p36. We believe we were the first digital camera history web site to provide a photo and information concerning this camera. KYOCERA SAMURAI X3.0 - 1987 (YASHICA - 1988). Despite appearances, these cameras were neither video cameras nor movies cameras, but Instead were the first models of a series of ergonomic (built-to-fit-the-hand for one-hand operation), half-frame, film SLRs that Yashica/Kyocera manufactured beginning in 1987. 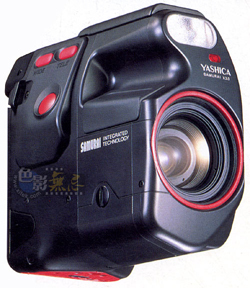 This video camera format was used again in 1990 with the Yashica Samurai V-70 still video camera and in 1998 with the Yashica Samurai DG1300 digital still camera. Kyocera zoom lens: 25mm-75mm,1:3.5-4.3 in half-frame, effective f-stops from f3.5 at wide angle to f4.3 at telephoto. Shutter: 2 sec. to 1/500 sec. The standard model is black, but the control buttons came in different colors, such as red and green. MINOLTA SB-70/S and SB-90/S - 1987. 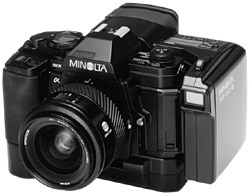 A still video camera system was devised by developing Interchangeable still video backs for the Minolta Maxxum 7000 and 9000 35mm film cameras. The cameras used the A-bayonet of the Minolta AF objectives as well as the system accessories usual for the cameras of the AF series. The standard lens was 20mm and the back had a 2/3-inch 640 x 480 pixel CCD. The photo in the middle shows the still video back opened away from the Maxxum 7000 camera on the left. 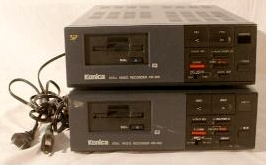 The photo on the right shows the MS-R1000/S recorder (top) and the MS-P1000/S printer (bottom). The backs were available with or without the S-designation which was used to indicate either the Japanese market or the U.S. market (S). MSRP for the back alone was $2,900 (about $5,700 in 2011 dollars). Understanding Electronic Photography, John J. Larish, 1990, p37. This is one of only two other SB70s with digital back that we have ever seen on eBay. One sold on eBay in 2011 for $1,125, and one on eBay in March of 2018 asking $1,799. See the following web sites for a lengthy discussion of these still video backs. We believe we were the first digital camera history web site to provide a photo and information concerning this item. Minolta Maxxum 7000 and 9000 35mm SLR film cameras - 1985. In January 1985 Minolta marketed the first mirror reflex camera with an autofocus completely integrated in the housing, the Maxxum 7000. Click on image for enlarged view. OLYMPUS V-100 MAJIN - 1987. 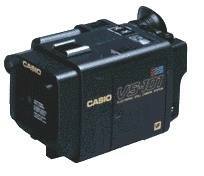 The V-100 still video camera was part of a modular system which included a V-200 or V-300 playback processor. 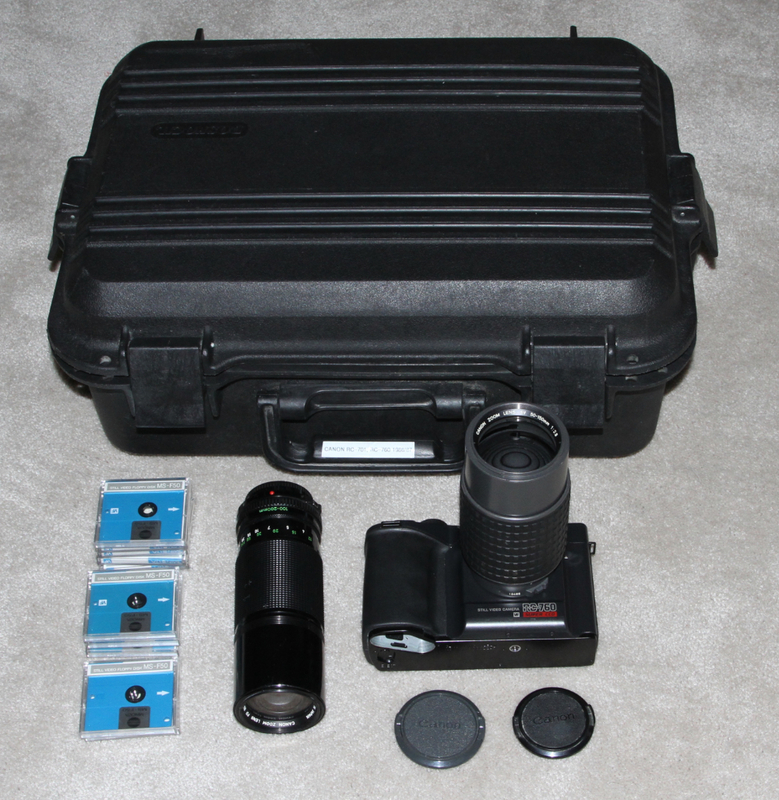 The V-100 used a 1/4-inch, 360K-pixel CCD with a 9-27mm f/2.8 zoom lens. ISO 100. Shutter 1/8 to 1/2000 second. Built-in flash. Hi-band still video mode. Burst mode of 5, 10, 15 photos per second. Understanding Electronic Photography, John J. Larish, 1990, p39. First photo is with playback device attached. Playback device could produce some darkroom effects. Popular Photography , December 1988, page 94. We believe we were the first digital camera history web site to provide a photo and information concerning this camera. 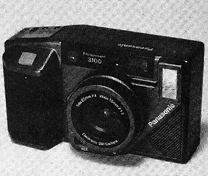 PANASONIC PHOTOVISION 3100 - 1987. Still video camera. The 3100 recorded 300K images onto a mini floppy disk. Predecessor of the 1988 AG-ES10. MSRP $1,200. Technical Photography, January 1987, page 42. Photo provided by Mike Mozart of JeepersMedia. We believe we were the first digital camera history web site to provide a photo and information concerning this camera. PHILIPS CONCEPT STUDY - 1986-87. A working still video camera, the Mavica, was demonstrated to the public by Sony in August of 1981. Some manufacturers such as Canon were quick to respond. 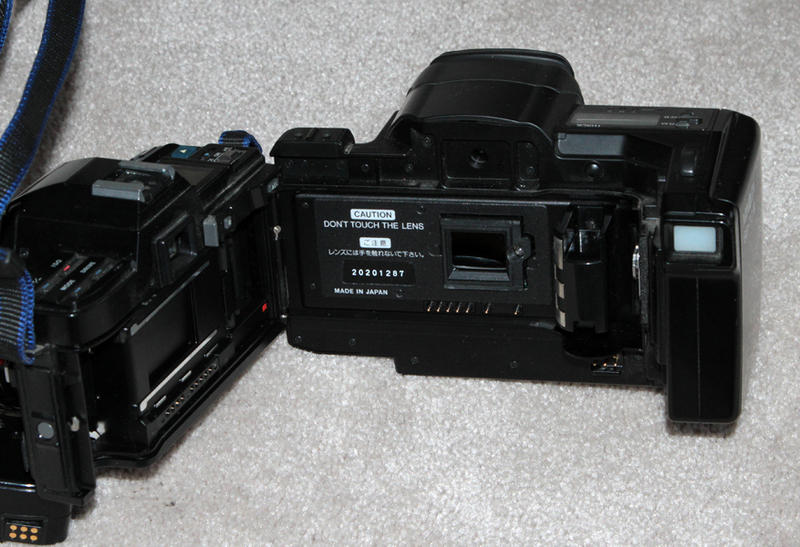 In fact fact, Canon actually beat Sony to the market with a still video camera, the RC-701 of early 1986. Sony followed a few months later with the Mavica A7AF. 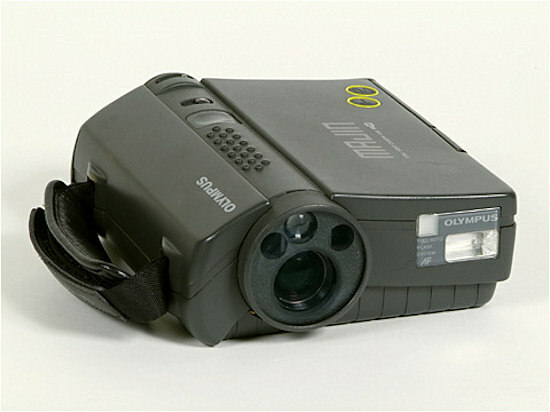 Philips was one of those companies that were slow to respond in this market and did not have a consumer camera ready until 1997. Back in 1986 and 87, Philips was involved in a concept study that included some drawings and wooden mockups. Finally coming to market eleven years after the initial Sony and Canon electronic cameras put them far behind the power curve from which they never did fully recover.